Super sub Adem brings down Sofapaka in Thika. Thika United FC got their winning boots back on over the weekend, by beating one time Champions Sofapaka FC 2-1 in a Kenyan Premier League (KPL) fixture staged at Thika Sub-County Stadium. 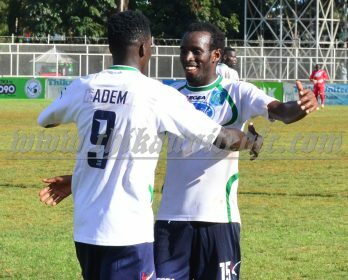 The long wait for Thika United to secure their first win this season finally ended on Sunday afternoon,Edmond Adem proved Thika United’s supersub, as he sprang from the bench to give Nicholas Muyoti a dramatic late victory. The youthful tactician couldn’t hide his delight as his second half change produced decisive dividends, when the former Palos FC forward timed a brilliant run to get onto the end of a perfect delivery from Clement Masakidi on 83 minutes. With the game in its infancy, scoring opportunities were scarce. The visitors ‘Batoto ba Mungu’ had the first decent chance of the afternoon in the 18th minute, with a crossbar strike from Yusuf Mohammed. Thika United were reduced to 10 men after Said Tsuma suffered an arm twist after an awkward fall in the latter stages of the first half, before being replaced by Dennis Odhiambo. Former Sofapaka forward Hansel Ochieng nearly put Thika United ahead in injury time of the first period, as matters ended all square.0-0. Sofapaka striker Kepha Aswani, who also at one time turned up for Thika United, confirmed his fine form heading in a perfect Stephen Waruru corner in the 47th minute to score for the visitors. But after that Masakidi, who joined Thika United at the start of the season, stepped up for Thika United, levelling in 58th minute by scoring from the spot after Hansel was brought down in area by keeper Kigonya. Masakidi then turned provider this time catching the Sofapaka defence napping and curled a fine cross through for Adem’s winning header in the 83rd, which marked his first league goal for Thika United and quite a memorable one since he joined back in 2017. Unused subs: Kevin Opiyo, Benson Iregi, Lewa Denis, Michael odongo. Thika United will be back in action on Sunday 15th away in Nakuru to play Ulinzi Stars at Afraha Stadium.Report by Ken_magu. ← Thika United settles a for barren draw at Awasi.